A few thought’s on the Arsenal v Spurs FACup third Round match | "It's all about the Arsenal"
FA Cup third round day – the tie of the round saw Arsenal at home to their North London non-rivals. Most football people understand that derby games but can be a lot closer than leagues positions tell. After winning at Old Trafford for the second successive season and with Tim Sherwood (noted Arsenal supporter) in charge of Tottenham for his first derby match Spurs arrived at the Emirates full of hope (don’t they always) that they could reach the fourth round. 5500 Spurs fans paid £62 each for a ticket, hid in the lower Clock End, made little noise for ninety minutes which was great as we only had one chorus of Ohhhhhhh Wheeeen Theeeeee Spuuuuuuuuurs, gooooooo Maaaaaaaaaarching iiiiiiiiiiin and left early when Arsenal had a fire drill in the Spurs end. After the early sparing and miss by Erikkson Arsenal went about tearing their side a new one. Adebayor recently called a warrior by Sherwood played up front with Soldado a forward who has more chance of falling over and digging his own grave, than scoring a goal from open play against premiership opposition. Spurs midfield lacks creativity. Their defence is average at best. They spent £108 million on this lot. Arsenal’s midfield lacked height, yet it’s full of imagination yet heir speed and accuracy of passing was sublime at times and Gnabry was very impressive. Cazorla is such a quality player and Rosicky is primed to attack. They may be small but they are hard to dispossess. 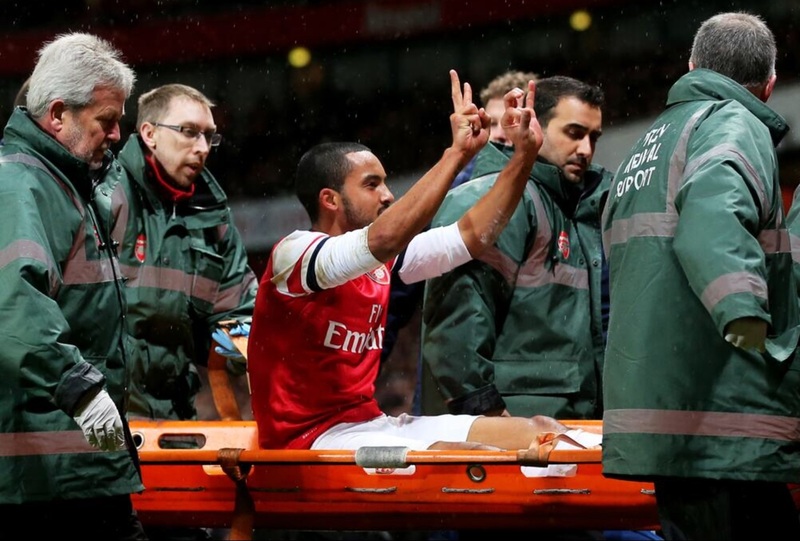 Spurs throw-in Arteta wins the header, Wilshere flicks ball to Rosicky-Gnabry-Theo’s shot is well saved by Lloris. Superb counter attack. It was no surprise when Sagna passed to Gnabry who strode forward, passed straight into Cazorla’s path and the little Spaniard hit a left foot rocket (timed at 97mph) past Lloris for 1-0 Arsenal and the first ever goal scored by Arsenal with a mango coloured football. HT 1-0 it could have been worse for Spurs. Vermaelen was replaced by the BFG, injury or his first half booking? The second half was all Arsenal as far a real chances were concerned and with only one more goal to show for their efforts on sixty-one minutes. Spurs had a corner, Co-commentator Andy Townsend says “Arsenal are far more accomplished with their football, but need far more daylight than 1-0”. The corner was cleared to the touch-line. Pressured Soldado passed the ball back to Rose. Rosicky like Arsenal as a team had done all match chased down Rose, nicked the ball and had a free run on goal. forty yards, a storming run later Tomas chipped the ball over Lloris to settle the match. 2-0. There you go Andy – Daylight. Other chances came and went, but it was to be another North London derby win for the Arsenal. Just like Giroud’s goal against Southampton earlier this season, I thought Rosicky’s goal was as much about chasing down and winning the ball, than a defender making a mistake. It’s superb play by the Arsenal player, forcing an error, making and taking advantage and for me not enough credit given to both Giroud or Rosicky. 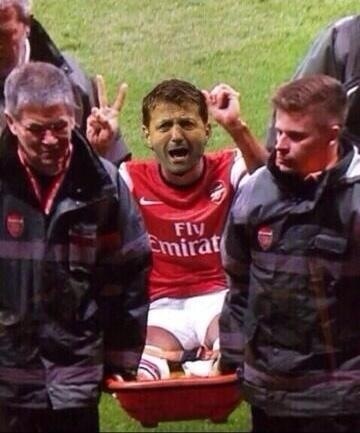 Some Spurs supporters could not take the gesture and went mental. Well played media, rather than concentrate on what matters a good win for by Arsenal in the rounds biggest FA Cup third round match, they’d rather concentrate on what Theo and the Spurs supporters did. You could say this match was easier than any of the two 5-2 home results against Spurs recently as it was so comfortable. So after seventeen years in charge Arsenal came out on top of Spurs eleventh manager during Arsene’s reign at the club. Current Superiority? Is 25 years current? 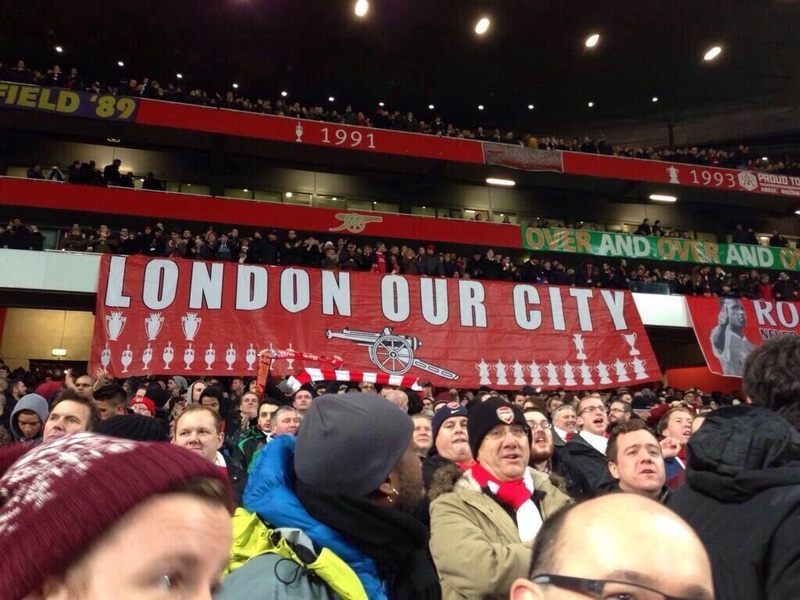 This banner says all we need to know about London football. I would say to Spurs supporters, go back to your homes, keep up with your hatred of Arsenal and you’re expectations. Your obsession with Arsenal, including the clubs board is what holds you back for me. Always looking to follow Arsenal’s lead and never, ever getting there. Your best season in the Premier League you still finish behind us after one of our worse. You play forty games one season after going out of both domestic cups at first hurdle, not being in Europe, finish fourth only to find you miss out due to Chelsea winning the Champions League, yet still finish behind Arsenal. As long as you take this route you’ll never top Arsenal always be in our shadow and the club that keeps on giving. Finally, though it was nice to hear Roy Keane’s view of the incident with Theo and saying he thought Spurs will always let you down and there fans acted as idiots. ITV’s football’s coverage is nothing short of shocking. The fact they have lost football from next season should be a joy for all football fans everywhere. People like Matt Smith and Adrian Chiles and so amateur and not even funny though trying to be. Not sure BT Sport are much better, but hopefully they’ll learn as time goes on. RIP ITV!!! Thank the lord for that.